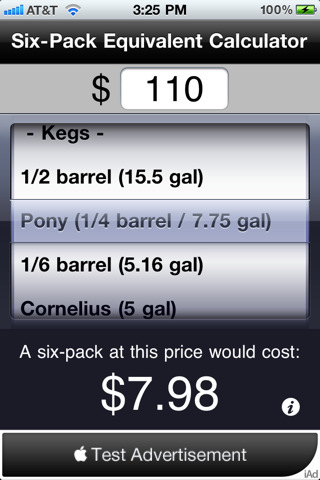 Earlier this month I introduced you to Lindsey's Android phone app for calculating six-pack equivalent (SPE) prices. 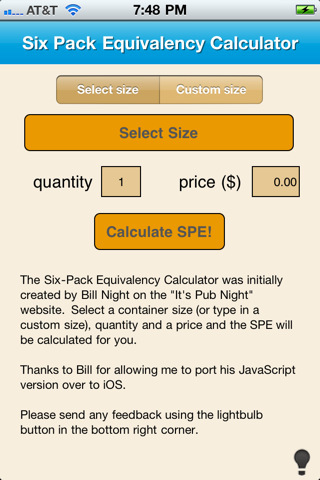 The SPE is a handy way to compare prices when beer is served in various quantities. When I wrote about Lindsey's app, there was a general outcry from the other 99% of smartphone users that there should be an iPhone app for calculating SPEs. I'm pleased to announce that there are now not one, but two iPhone SPE apps, thanks to two enterprising readers. First out of the gate was Shawn Bernard, whose ad-free SPE calculator will set you back a mere 99 cents. A competing app by Mark Rickert is an ad-supported free Six-Pack Equivalent calculator. Full disclosure: I have a gentleman's agreement with these guys to kick me back 10% of everything they make over $50K on these apps. I'm gonna be rich. Meanwhile, Lindsey has been busy, and he now has a "Buy Me a Beer" ad-free edition of his Android SPE app, selling for $2. Of course, if you're an Android user and you don't want to buy Lindsey a beer, or buy me 1/500,000th of a beer, he still offers an ad-supported free version. I downloaded the free iPhone App. It's great. Very simple and easy to use.